Reviewed by Elizabeth Amisu, MA, PGCE, author of ‘The Dangerous Philosophies of Michael Jackson: His Music, His Persona, and His Artistic Afterlife’ and creator of the ‘Introduction to Michael Jackson Studies Online Course’. Author, Joseph Vogel, is perhaps best known for his groundbreaking opus on Michael Jackson — Man in the Music: The Creative Life and Work of Michael Jackson, an expansive and holistic dynamic exploration of Jackson’s solo adult works — from Off the Wall to Invincible and beyond. An academic who has essentially built the current landscape of Michael Jackson Studies, any new release from Vogel is worthy of close attention. In Earth Song: Inside Michael Jackson’s Magnum Opus, the first edition published by BlakeVision books in 2011, the second in 2012, fully revised and updated, the academic book review for the second edition (which I reviewed in 2014) is available via the following link: http://michaeljacksonstudies.org/earth-song-inside-michael-jacksons-magnum-opus-by-joseph-vogel-blake-vision-2011/. 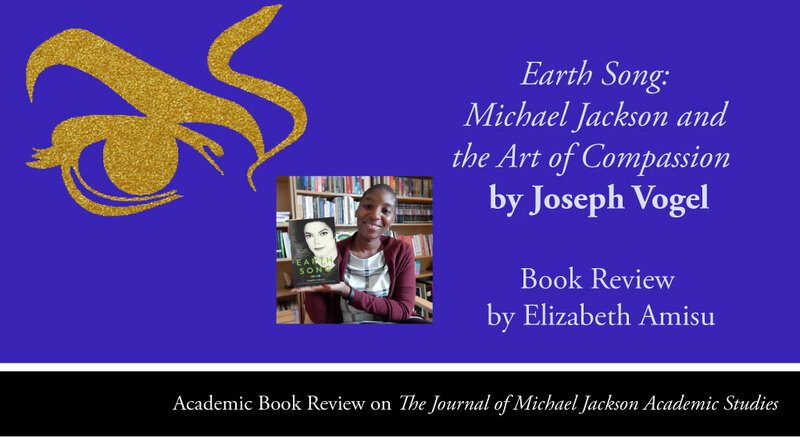 This new, third edition is reviewed in detail below, predominantly for the purpose of elucidating why Earth Song: Michael Jackson and the Art of Compassion is a worthy addition to any bookshelf. Focusing as the prior edition did, on the emphasis Jackson places on his own compassionate response, published five years after the second edition and six years after the first, both books follow a similar narrative style. One of the most salient features of the second edition (2012) was its generous use of footnotes to provide extraordinary background detail and extraneous elements, further fleshing out Jackson’s creative process as well as his contexts of production and reception. One of the most noteworthy aspects of this book and any written by Vogel is his remarkable attention to necessary, important facts and insights. His analysis considers all aspects of the song, even the perspectives of Jackson’s detractors. This causes the reader to question the validity of the criticism both Jackson and his work received at the time of the song and short film’s original release in 1995. Vogel was easily one of the very first academics to consider Jackson’s work as “art”. Nowhere else is the physical touch of the artist, sculpting, moulding, shaping and birthing a creative work into life more present than in this new edition. Key differences, alterations in the new edition begin with the title, which now puts stronger emphasis on artistic vision and intention. The book consists of mini-chapters, highly focused and incredibly dense with key facts, offering a panoramic overview of the text. From 26 segmented mini-chapters in the second edition, we are now given 30 segmented chapters in the revised edition. This includes an entire segment on ‘Man in the Mirror’, preceding the ‘We are the World’ segment. The segmented style, showcased throughout Man in the Music and Featuring Michael Jackson is highly useful for researchers, enabling them to dip in and out of key sections to arrive at the specific segments that offer the most to their personal point of focus. Nestled in the early section of the book is another new section — ‘Endangered Earth’, which expands on the highly important debates about the climate change, which weighed heavy upon Jackson’s heart and mind in the late 1980s and remain an important topic of discussion for us today, more than twenty years later, as showcased by several films and documentaries. Further new segments include ‘Sunrise’ and Jackson’s creative connection to the Beatles and ‘Heaven is Here’, reiterating Jackson’s deep personal and spiritual connections as evident in the track, ‘rooted in the fervent jeremiads and apocalyptic passion of the Bible’ (loc. 379). There is also some movement of key sections and segments into an order that greatly aids the book’s readability. A trio of new segments greet readers entitled, ‘Outsiders’, ‘Storytelling’ and ‘Action’, which elucidate both the song and short film’s journey to a new level of detail that is not available anywhere else. Especially with regards to the highly specific and original research. Vogel brings together a wide range of contextual analysis and one-to-one interviews with key players in the song’s creation, including personal interviews with a wide range of people, including director, Nick Brandt. Earth Song: Michael Jackson and the Art of Compassion is a vital introduction to Jackson’s creative process, critical reception and artistic afterlife. It easily offers enough new and additional material to warrant both repurchase and re-reading of owners of the book’s first and second editions. It is an indispensable resource for the researchers’ library, not only for the level of detail it contains but the model of analysis it illustrates. Elizabeth Amisu, author of The Dangerous Philosophies of Michael Jackson: His Music, His Persona, and His Artistic Afterlife, holds an MA in Early Modern English Literature from King’s College London. She is co-founder and editor of The Journal of Michael Jackson Academic Studies online. For The Journal of Michael Jackson Academic Studies she has edited two publications, An Academic Companion to Michael Jackson Studies and Michael Jackson’s Dream Lives On: An Academic Conversation – Michael Jackson & Prince; written several articles and book reviews, most notably ”Throwing Stones To Hide Your Hands’: The Mortal Persona Of Michael Jackson‘, which has been translated into Spanish and Italian; ”The Isle is Full of Noises’: Revisiting the Peter Pan of Pop‘, available in German; ”Crack Music’: Michael Jackson’s Invincible‘, also in Italian; and ”Heard it Through the Grapevine’: Are We Losing Michael Jackson All Over Again?‘, also available in Spanish. Find out more at elizabethamisu.com. 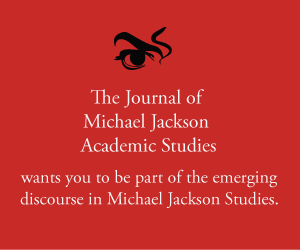 Episode 3 – What is Michael Jackson Studies? 7th February 2016 Karin Merx Comments Off on Episode 3 – What is Michael Jackson Studies?